The advantage of cotton and linen scarves is that they are inexpensive, soft and skin-friendly, and have a wide selection of colors. There are two main drawbacks, one is not warm enough, the other is that the color material selection does not look good texture (dark color than light color texture, pure color than pattern texture). If you want to keep warm, you should choose wool or even cashmere. 100% wool or wool blended cashmere is generally skin-friendly, and it feels better if you mix it with some silk (of course, the warmth goes down). And usually the cashmere scarf looks better and better. In short, it is very cost-effective to buy a good cashmere scarf, because a good cashmere scarf can not only be versatile, but also the quality is excellent, at least let you use it for three or five years. Of course, do not take care of the ball, and occasionally shave it with a machine that shaves the ball. 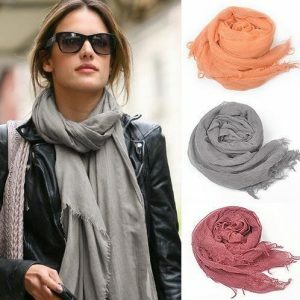 Therefore, I personally recommend buying cashmere or wool scarves.